Toronto has some killer young actresses, a few of whom have found particularly big showcases in small productions currently on Toronto stages. Below are a few of note, in order of impact. There’s a lot to like about Harrison Thomas’ brutal and inventive production of Julian R. Munds’ adaptation of The Changeling in The Box’s epically indie space but nothing- not the clever use of Tallan Byram as a score-providing, set-moving, blood-mopping, silently narrating “Stage Hand”, not set designer Claire Hill’s versatile shadow-screen flats, not the fancy fight or Hill & Julia Matias’ beautiful costumes or even Prince Amponsah’s wonderful take on abused abuser DeFlores (certainly not Sebastian Marziali’s cartoon pirate of a Alsmero)- comes close to Lauren Horejda’s show-defining turn as Beatrice, the would-be bride whose cruelty is returned to her ten-fold. It’s a visceral, punishing, unforgettable performance that further places 2015 MyTheatre Award nominee Horejda among the elite of this town’s young leading actors. This strange, inconsistent drama about newly separated conjoined twins is a lot like one of its own characters- “Barney” (played with sympathetic misery by Ken Caughey). Limping along and hard to love, Barney becomes somewhat entranced by a mysterious stranger he meets in the men’s room (Michael Hogan’s intriguing Brody). Barney, and the audience with him, is distracted and impressed by the charismatic Brody, his unknowable morality and his rich backstory. But Barney is sickly since being separated from his sister; it’s his sister who gives him life and comfort and purpose. As played by Christina Bryson with great wit and empathy, strong, ambitious and conflicted “Betty” is the reason Barney is alive and the reason to see Choking the Butterfly (hint: she’s the butterfly). Anne van Leeuwen’s feisty Beatrice is the grounding force of this pretty, garden-set Much Ado with its beautifully painted (by Pascal Labillois), if horrifyingly wobbly, pillars and charming live music (Carina Cojeen, James Karfalis & Shalyn McFaul). Chloe Sullivan’s self-serious Dogberry is the highlight of the whole production, elevating an often tiresome role with perfect timing and well-placed vulnerability alongside her hilariously over-zealous sidekick Verges (Melissa Williams). Clare Bastable’s otherwise inconsequential (and terribly costumed) Hero becomes the centrepiece of the most refreshing take on the hard-to-swallow fifth act I’ve ever seen, playing unforgiving fury and aching sadness as her “happy ending” falls into place (many kudos to first-time director James Graham for the thoughtful insight and bold direction of those scenes). 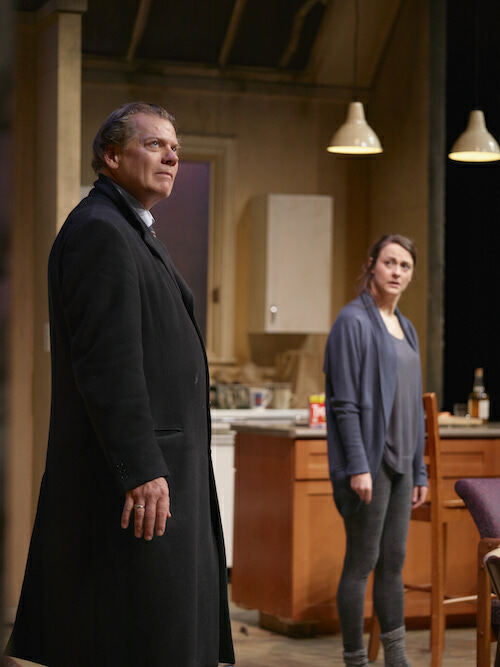 Shalyn McFaul turns around the throaway role of Antonia (usually Antonio) and delivers one of the most moving scenes in the play with real tears in her eyes. Cam Sedgwick’s simmering Don John makes an impression but this Much Ado firmly belongs to the women. I hated this play. Produced with much fanfare (and many subway ads), this British import is simple, simplistic and simpering with unlikeable characters, zero heat and very little in the way of actual plot. Sara Topham’s practiced British accent makes it sound like she’s still playing Wendy in Peter Pan but at least she displays some charm and considerable effort in her attempts at decent drama; Lindsay G. Merrithew quite notably does neither. Only Tim Dowler-Coltman in the show’s smallest role gives the audience anyone truly worth rooting for. If only the resources dedicated to making it snow outside the Debra Hanson-designed run-down apartment in Skylight could be reassigned to literally any of the companies listed above, think of the creativity that could replace this indulgent nonsense. 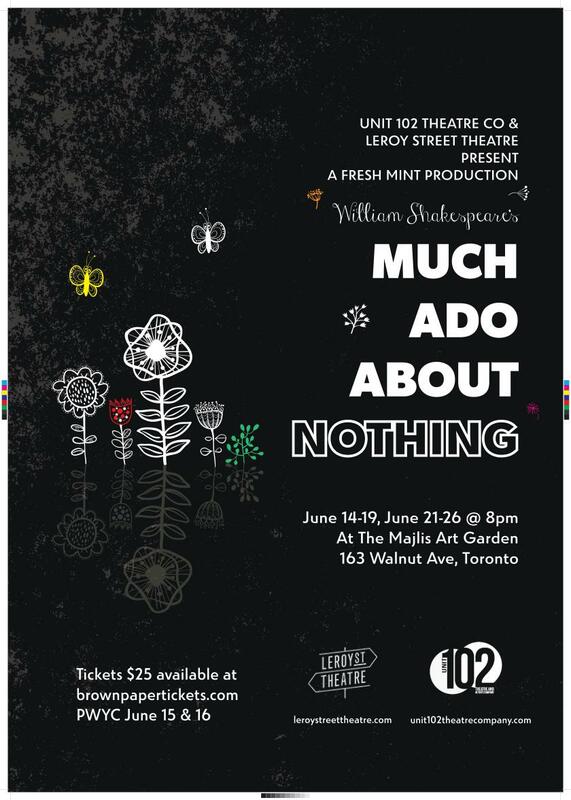 In: Adaptations, Classical Theatre, Contemporary Theatre, Desiderata Theatre Co, Indie Theatre, Leroy Street Theatre, One-Acts, Rarely Pure Theatre, Reviews, The Fresh Mint Project, Theatre Reviews, Toronto, Unit 102 Actors Co.